And in Marion’s car he had all of our clothes, a crate, and Kona! We wanted to make sure she was safe and sound and didn’t feel too cluttered with all the surfboards and bulky items around her. We drove straight to my parent’s house where Kona will be staying for the next 5 nights while we are camping. 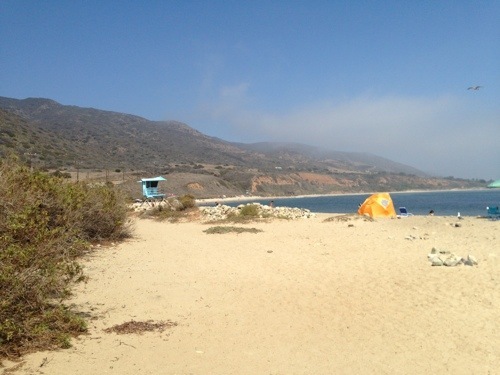 Luckily my parents only live about 30 minutes from where we are camping, so it will be easy to come and go if we need to. My parents have an 8 year old Golden retriever names Bailey who is very sweet. Kona will enjoy being around her. My parents also have a pool, and we took Kona swimming for the first time ever! We walked her out to the middle of the pool and let her swim to the steps. 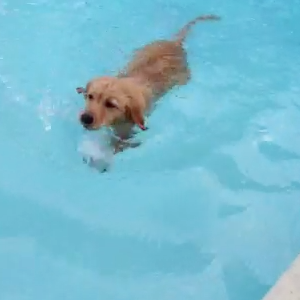 She was doing the doggie paddle – her natural instincts are just incredible. We took her in the pool a few times and then wrapped her in a big towel. She was cold and shaking, but she warmed up quickly. It was a new, big experience for her! Afterwards we got ready to head over to camp. It is going to be so hard to leave her for several days, but we know my parents will take great care of her. Have fun at Grandma and Grandpa’s, Kona!